Above ground you’re following in the footsteps of Francisco Vázquez de Coronado, below ground terra incognita may remain for those patience and adventurous souls. Coronado National Memorial is located 16 miles south of Sierra Vista off of AZ 92. The near 2 hour drive from Tucson will transport you to a land that straddles the border, multiple worlds and different times. Founded in 1941, with the intention of becoming a binational memorial that would have been shared by Mexico and the United States. But it ended up as a unit of the National Park Service in 1952. While the park is a comparatively small 4,750 acres it boosts a wide diversity of habitat, the topography is varied as well it’s second longest trail “Joe’s Canyon Trail” starts at the Visitor Center at an elevation of 5230 feet and winds 3.5 miles one way over an elevation gain of 1634 feet to Coronado Peak. The view from Coronado Peak rewards with a sweeping panorama of the border and the San Rafael Valley to the west and the San Pedro Valley to the east. If don’t feel inclined to do that long of a hike there’s the option to drive your vehicle up Montezuma Pass and do a short .8 mile roundtrip hike to the peak from a parking lot at the overlook. It becomes a dirtroad after the Visitor Center, however it doesn’t require high vehicle clearance. 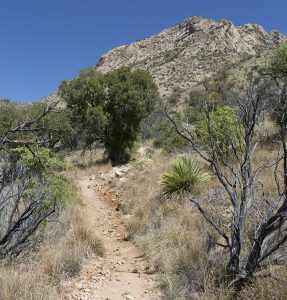 The trail up to Coronado Cave, around the halfway point. 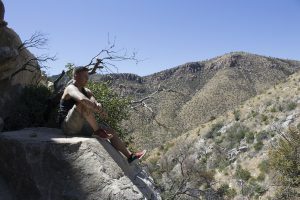 The longest trail in the park starts at the Mexican border as Yaqui Ridge trail, after a mile it joins Joe’s Canyon trail which in turn feeds into the park’s longest trail The Arizona Trail. The Arizona Trail then continues out of the park into the Miller Peak Wilderness and stretches 800 miles to Utah. This first segment of the Arizona Trail runs 20.8 miles and connects the Memorial to Parker Canyon Lake. 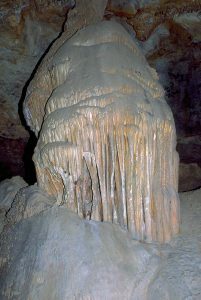 The Memorial offers access to Coronado Cave from sunrise to sunset. Hiking to the cave is a mile round trip outing that has an elevation change of about 500 feet. Two light sources are highly recommended for everyone entering the cave. Additional, the National Park Service stresses that pets aren’t allowed on the trails or within the cave. The cave is considered an active growing cave because it’s stalactites and stalagmites are still actively (read also very very slowly) growing. Touching of the cave walls and formations is prohibited because of this. However, because the cave is open access it requires good stewardship by all of its visitors and for visitors to report damage to the visitor center. Shannon Gramley hangs out at the end of the cave trail.